The Intercontinental Da Nang Sun Peninsula Resort, located in Da Nang, Vietnam is hands down the most beautiful resort I have ever seen. With a private beach, two pools, five restaurants and amazing grounds this place is a hidden paradise. The resort is nestled into a massive private bay called Monkey Bay- which true to its name has a lot of Monkeys! 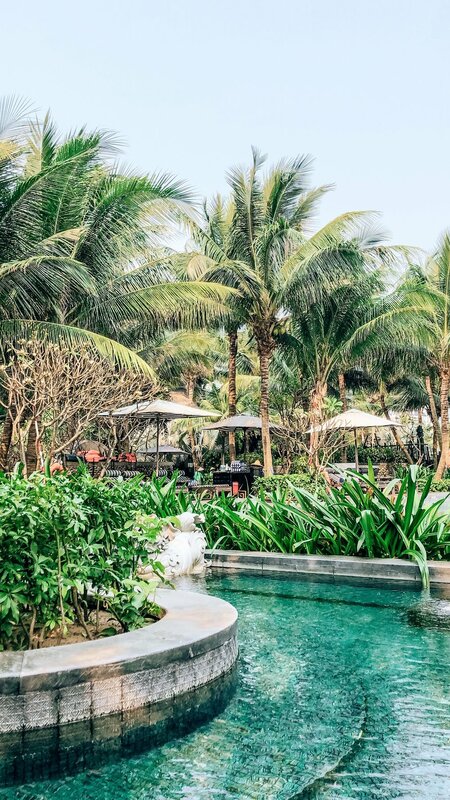 Just a 30 minute drive from the Da Nang airport, It feels like you are entering a whole new world. We were picked up from the airport with a car that had wifi and snacks (big plus!) and greeted upon arrival with the friendliest staff. 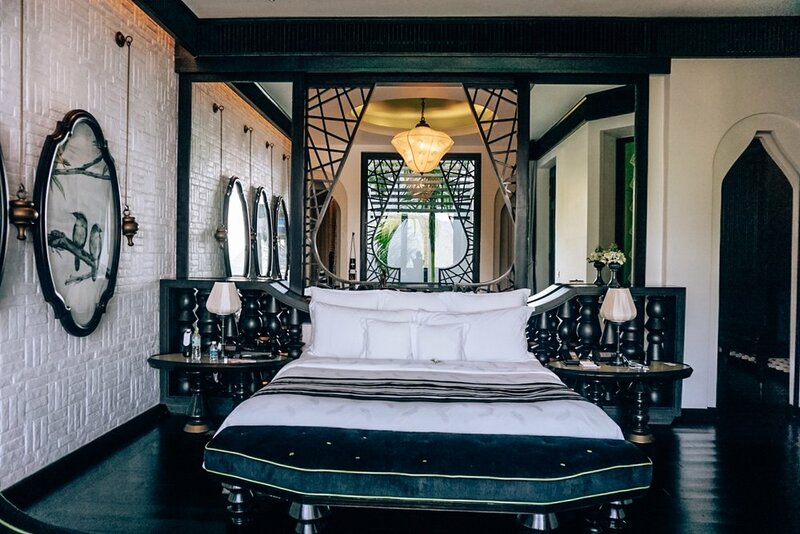 We stayed in a peninsula executive suite which is a stunning suite decorated in traditional Vietnamese furniture, with one of the biggest terraces I have ever seen. If you stay in a suite you also get special Club Intercontinental privileges. With access to the private lounge, complimentary afternoon tea and evening cocktails- it is absolutely worth an upgrade. Every night from 5:30-7:30pm you could go to the lounge and have cocktails/wine and bites! This was one of our favourite perks of the hotel. The lounge had an amazing outdoor terrace you could enjoy the panoramic views of the bay- and if you are lucky, monkeys! The pools and beach were of course one of my favorite aspects of the hotel. The L_O_N_G Pool, located above the Long Bar has an incredible infinity pool overlooking the Bay. It was definitely the best spot to tan and enjoy a drink by the pool. The other pool is next to the bar, with amazing views of the beach and an incredible stone hot tub. You could easily walk onto the beach, or stroll over to Buffalo bar for an amazing lunch on the beach (FYI- best Chocolate fondant and mango stick rice I have ever had). The Citron also had private dining pods that float over the bay. You could reserve these for any meal, or my personal favorite- high tea! Absolute must to get a great pic dangling over the edge (before they tell you to move of course). Overall the Intercontinental Da Nang was one of the best experiences at a resort I have ever had. The property was actually breathtaking, and the food and staff were all incredible. 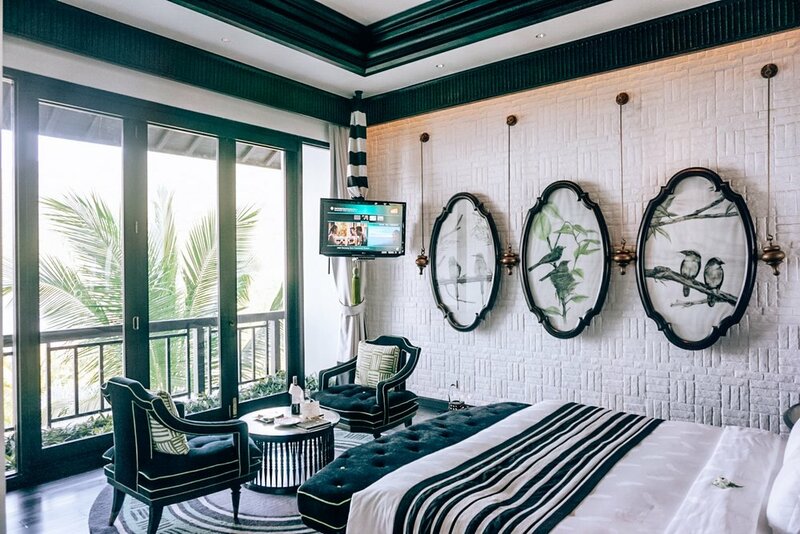 The Intercontinental Da Nang has definitely thought of everything you could ever need to truly make your stay an unforgettable one. I highly suggest making the trip to Da Nang, Vietnam to visit this resort.